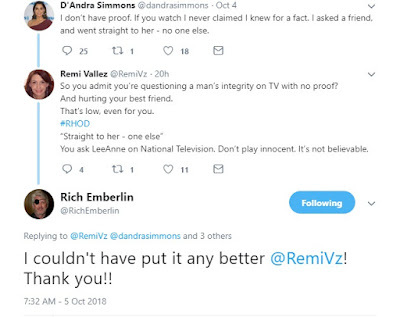 iRealHousewives | The 411 On American + International Real Housewives: LeeAnne Locken’s Fiancé Rich Emberlin Slams D’Andra Simmons And Reacts To Cheating Allegations — Tiffany Hendra And Stephanie Hollman’s Husband Travis Come To Rich’s Defense! LeeAnne Locken’s Fiancé Rich Emberlin Slams D’Andra Simmons And Reacts To Cheating Allegations — Tiffany Hendra And Stephanie Hollman’s Husband Travis Come To Rich’s Defense! LeeAnne Locken's fiancé Rich Emberlin took to Twitter to react to D'Andra Simmons recent allegations. 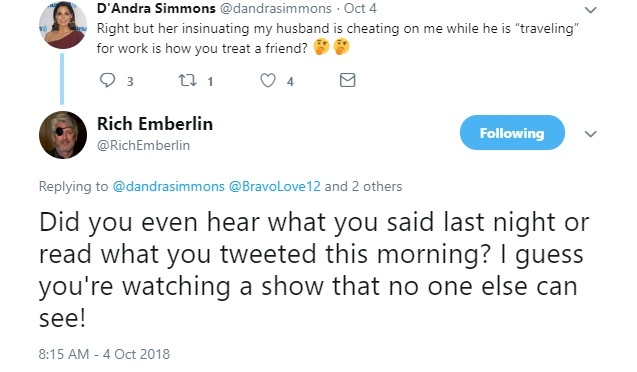 If you recall, Simmons accused Locken's fiancé, of infidelity during this week's episode of The Real Housewives of Dallas. "She needs to stick to dropping K-cups out of her backside instead of baseless lies! I don't normally comment too much but she is sitting in a glass house and throwing stones and I've had enough of her BS remarks. She REALLY doesn't want me to get vocal about her situation," he tweeted. D'Andra tweeted, Right but her insinuating mu husband is cheating on me while he is "traveling" for work is how you treat a friend," in which Rich took to opportunity to respond to D'Andra after she suggested that he and LeeAnne have been living "separate lives." "Did you even hear what you said last night or read what you tweeted this morning? I guess you're watching a show that no one else can see," responded Rich. 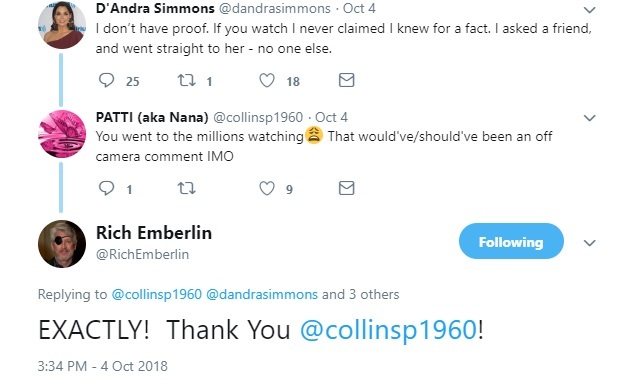 When a fan called out D'Andra for suggesting the LeeAnne and Rich lived "seperate lives," she responded, "I don't have proof. 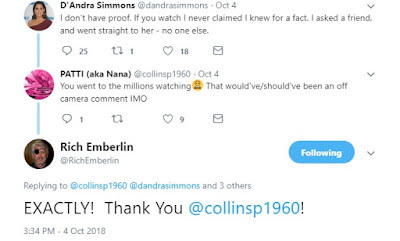 If you watch I never claimed I knew for a fact. I asked a friend, and went straight to her - no one else." Then a fan called out D'Andra for "questioning a man's integrity on TV with no proof and hurting your best friend," Rich responded, "I couldn't have put it any better." Meanwhile, Stephanie Hollman's husband Travis Hollman came to Rich's defense following the episode airing on Bravo. 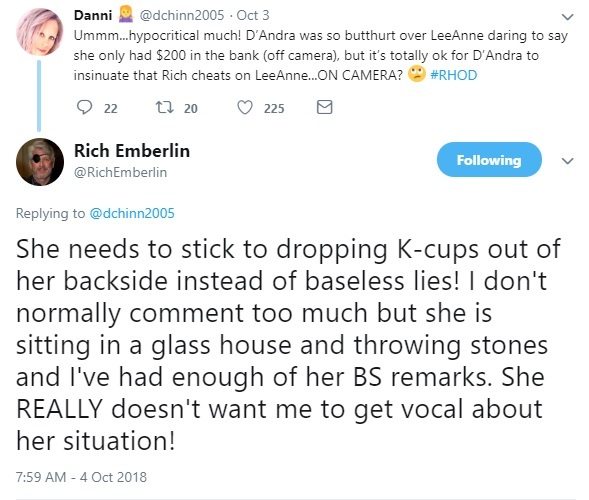 "@RichEmberlin is a great guy and I always hear how much he loves LeeAnne. Some has bad information. #RHOD," wrote Travis, in which Rich responded, "Thanks Brother! Someone has zero information!" As for LeeAnne's bestie Tiffany Hendra, who appeared in the first season reacted to D'Andra's allegations via Twitter. 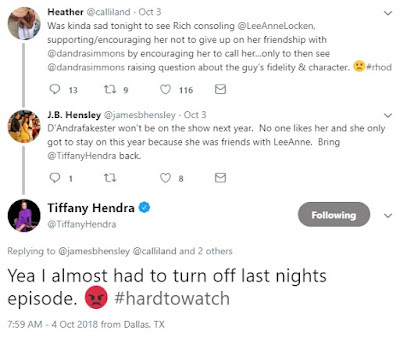 "Yea I almost had to turn off last nights episode," she wrote adding an angry emoji face along with the hashtag "#hardtowatch." What are your thoughts? Sound off in the comments below!